Photofacials, also known as photo-rejuvenation, IPL or BBL laser treatments, use light to mend the damage caused by the sun and aging. This proprietary treatment protocol consists of a series of Intense Pulsed Light treatments that improve the appearance of rosacea, flushing, sun damaged skin, age spots, skin texture and photo aging. 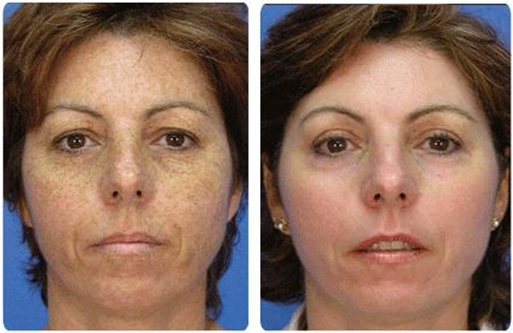 If you seek a more even complexion, then PhotoFacial is the treatment you want. This treatment involves little or no downtime and you can resume normal activities immediately. Any area of the body can be treated. The most common areas are those most exposed to the damaging effects of sunlight such as face, neck, back of hands, chest and shoulders. An intense light is applied in a series of pulses over the treatment area. Without damaging the skin, the light penetrates through the skin and is absorbed by the abnormally dilated vessels or pigmentation. The heat impairs the vessel or lesion and the body begins its natural healing process. The lesion will darken before it flakes off or is absorbed by the body. In addition, the heat absorbed by the targeted areas will stimulate your skin cells to regenerate new collagen. This process will restore your skin to its natural beauty, blending its natural colors and making it smoother, vibrant and younger looking. A PhotoFacial treatment may vary from 15 to 45 minutes depending on the size of the area being treated. Most patients easily tolerate the procedure with no numbing creams. First, pre-treatments photos are taken in order to monitor the IPL progress after each treatment. Next, the area is cleansed and a thin layer of Ultrasound gel is applied, and your eyes will be protected with safety shields or metal goggles. When the pulse of light is delivered, you may briefly feel a warm or rubber band snap sensation as the light is absorbed by the targeted areas. Your PhotoFacial treatment is a gentle, noninvasive and safe procedure. You may briefly feel a warm or rubber band snap sensation during the treatment. Most patients easily tolerate the procedure with no numbing creams. The number of treatments that is needed varies from patient to patient. series of 3-5 sessions are typically recommended. During your initial consultation we will customize a treatment plan based on your desired level of improvement. You may experience some redness that should resolve within a few hours. For some pigmented lesions, you will see a darkening of the treated areas followed by fading and flaking off . Your treated skin will feel smoother, fine lines and pores will be less noticeable, and sunspots or uneven pigmentation will fade. Results depend on your condition, the number of treatments, and the area treated. Are there any possible side effects of a PhotoFacial treatment? Side effects of PhotoFacial treatments are rare. Immediately following a treatment, the skin may appear flushed, brown pigmented spots may appear darker and capillaries may be more visible. How should I prepare for my PhotoFacial treatment? You will need to avoid UV exposure for 2 weeks before and after your treatment. An active tan from the sun or tanning beds is not appropriate. Tanned skin has a lot of pigment or melanin, which may also absorb the IPL light energy. Self-tanners must be faded from the skin for at least 14 days prior to treatment. Who is not an appropriate candidate for PhotoFacials? -Patients who have an active fever blister on the face. (An anti-herpesmedication can be given, thus avoiding break outs). -Taking Accutane currently, or for twelve months after stopping. - Ethnic skin is NOT a candidate for Photofacial treatments due to the increased risk for permanent hyperpigmentation. Most photosensitive medications such as antibioics, anti-anxiety, sulfa drugs, birth control pills and anti-hypertensive medications are not a contraindication.